The names of Greenwich's war dead were not inscribed on the local War Memorial. The fallen were rendered almost invisible. Until now. 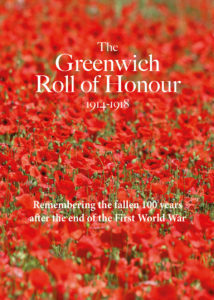 The Greenwich Roll of Honour: 1914-1918 is a new publication timed to coincide with the 100th anniversary of the end of the First World War. This poignant booklet reproduces the list of Greenwich's fallen which was originally compiled by the Metropolitan Borough of Greenwich and placed inside the borough war memorial at the top of Maze Hill. See the list of about 1850 local men who died and read the story of the borough's war memorial alongside new colour photography of local memorials. This special booklet, with a foreword by the Revd Canon Chris Moody, is out now. The Roll of Honour booklet is our now. It costs £5 + £2P&P and can be ordered online or purchased in the stockists listed below. If you would like to order a copy for a local school, please place an order as normal and email rob@greenwich.co.uk to specify the school and a printed label will be inserted naming you as as the donor before it's sent to the school. On page 4 & 5, a mistake made by the Kentish Mercury in 1922 and has been repeated verbatim. The name Saunders should be replaced by the name Sanders.